Your car’s battery is an essential part, providing the power which does everything from turning over the engine to help start it, to keeping your lights working. Over the past few years, car batteries have undergone an important change. Not too long ago, they used to need regular checks to ensure that they were kept topped up with distilled water, which used to be needed to dilute the acid formed by the lead which was the battery’s main component. Today though, most batteries are completely sealed, self-contained units, which has helped eliminate the risk of this acid leaking, and therefore the possible damage it can do to the exposed parts of a car’s engine. But just like any other kind of battery, those in your car lose their ability to recharge themselves over time, and this brings about the telltale signs of your car engine being more difficult to start, interior and exterior lights becoming dimmer, and possibly, other components such as the audio system showing signs of losing power. Can I Help Make My Car Battery Last Longer? There are a few steps you can take to help prolong the life of your car’s battery, and most are simple and obvious. They include making sure that every item which draws power from the battery (e.g. windscreen wipers, heated front or rear window) is always switched off when you leave the car. Something as simple as an interior light left on can, over just a few hours, drain the power from a battery, leaving it unable to recharge itself as it normally would while your car’s engine is running. Constantly undertaking short, stop-start journeys - these are the toughest for any battery, and won’t give it long enough to charge up fully. Before we move on to the main purpose of this piece - to describe the safest and easiest steps for how to replace a car battery - here’s a list of the most important things you need to consider while carrying out what’s essentially a pretty straightforward job. Ensure that the car is parked somewhere flat and level. Keep the ignition switched off throughout. Be sure to have any PIN codes for your in-car audio and security systems to hand, as you may be asked to enter these once the new battery is reconnected to make them work again. Make sure that you disconnect and re-connect the terminals in the right order - see full details below. Ensure that the terminal wires are kept away from the battery itself once they have been disconnected. Also make sure that the lead to the positive terminal does not touch any metal part of the car, as this could lead to the area becoming ‘live’ and causing a shock to anyone touching it. Now we move on to the real job in hand, please see a guide as to how to replace a car battery, this will incorporate the advice above to reinforce its importance. If you’re unsure where your car’s battery is, consulting the handbook will tell you. With your car parked on a flat, level surface, the handbrake on, and keys removed from the ignition, open the bonnet and locate your battery. Make sure you use any stays fitted to keep your bonnet up throughout the operation, or if there are none, that the bonnet is kept raised to its maximum. Remove any plastic covers or trims from the top or sides of the battery. If it isn’t clear which cable running to/from the battery is which, make sure you know, and label them as positive and negative before you start. You might find that the cables are colour-coded, usually red for positive and black for negative. Loosen, then disconnect, the negative cable first, being sure to keep the wire well away from the battery (see 5 above). Loosen, then disconnect the positive cable, taking the same care as above not to let the cable come into contact with the body of the battery. It’s common for the battery to be held in place by a metal bar or frame. Now unfasten and remove these. If they come away completely, make sure you put them somewhere safe, and know where to find them again! Disconnect any vents which might be attached, to help keep the battery cool and direct heat safely away. You should now be able to lift the battery out of its housing. But it could be heavy enough for you to need help, so make sure someone is on hand to give you this if necessary. Lift the new battery into place, making sure that you put it in the right way round, so that the positive and negative terminals are on the correct sides. Take off any covers protecting the new battery’s terminals. Reconnect the positive cable clamp, making sure that it is placed as far down on the battery post as possible. Reconnect the negative cable clamp, again being sure that you do this as far down the battery post as you can. Now re-start the vehicle, and check that your lights and heating/air-con are working correctly. Re-set any codes needed for your radio, other in-car entertainment and/or sat-nav system. 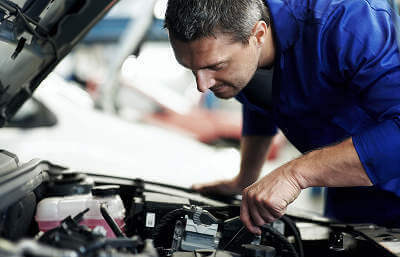 Once you’ve learned how to replace a car battery and done it once, you should find it gives you the confidence to be able to tackle this job at any time. But as we mentioned above, there could be reasons, such as the battery being too heavy, or you being unsure of how to remove it, when a little expert help is in order. Don’t worry - it’s a common maintenance job, and according to the motoring organisation patrols, one which they’re most often called out to deal with. According to the AA, flat batteries, and general problems with a vehicle battery, account for more call-outs than any other fault. So at least knowing where to find your battery - especially if it’s one of the minority of cars these days where it isn’t found under the bonnet - can be a major help to getting started with putting problems right. Knowing the major risks associated with fitting a replacement battery will also ensure that you keep yourself safe, and possibly avoid causing serious damage to your car. It’s a fairly easy job, but as you can see from the number of emergency call-outs attributed to faulty or non-working batteries, the chances are that you could fall victim sooner or later. There’s no need to worry if you don’t feel confident enough to fit a replacement car battery yourself - plenty of garages and mechanics are equipped to easily deal with the job. So if your car needs a new battery and you don’t know where to turn, you can ask for quotes using MyCarNeedsA.com. Register for free, and you can soon start getting car battery replacement quotes to help get you moving again.